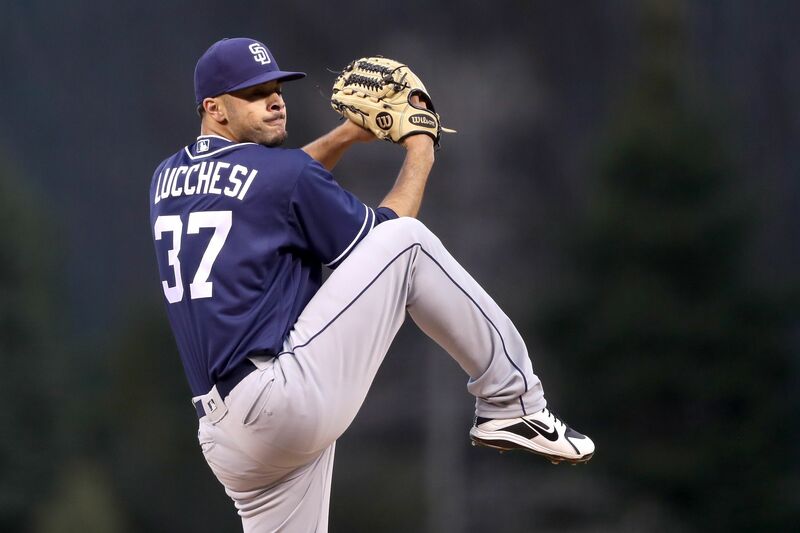 Joey Lucchesi has had an impressive rookie campaign, which is not a surprise to those who know how hard he works in an effort to get better. He sat down and spoke with EVT this week about his college days, expectations he has for himself and his “funky” mechanics. 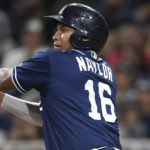 In this 2018 season, there have been several young players who have stepped up. 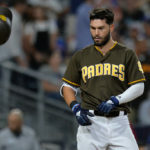 It is truly an exciting time for the San Diego Padres and their fan base, as there are dozens of relevant prospects about to hit the major leagues. 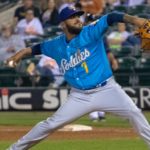 Left-handed pitcher Joey Lucchesi has established himself as a key member of the rotation this 2018 season and that is a great thing. He has shown a craving to get better that has been evident since his days at Southeast Missouri State University. It was there where he established himself as one of the best collegiate pitchers in the nation. A successful Junior season where he finished 7-2 with a 3.17 ERA and struck out a league-high 93 batters didn’t earn Lucchesi a draft call. All 30 teams passed on him and that motivated the youngster. During his senior season, Lucchesi went 10-5 with a 2.19 ERA and a 1.20 WHIP. He was a third team collegiate All-American, striking out 149 batters in 111 innings pitched. 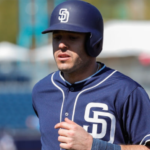 The Padres selected him in the fourth round, but his numbers dictated he should have been drafted higher. Yes, Lucchesi pitched in the Ohio Valley Conference, but that was still a Division-1 school. The intensity to get better and prove everyone wrong still burns. This innate determination to become better and improve is how he battles and competes each and every day on the ball field. When adversity hits on the mound, he does not shy away from it and attacks it head-on. That is rare. Especially in a rookie. 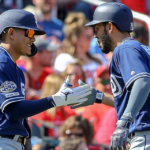 On Wednesday, I caught up with Lucchesi as the Padres ended a three-game set with the rival Giants. It was night after he pitched, so we first discussed some things from the night before against San Francisco. 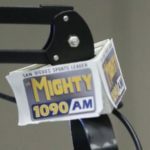 Andy Green refers to Joey as a battler or fighter. I asked him about these comments and what they meant to him. “Every time I go out on the mound, I try to give my team the best chance to win. With or without my best stuff, I always try different ways to win and succeed. I think he (Green) realizes that. I am really trying hard to get wins for the team and keep us in the game. I am super passionate about it.” For a young pitcher to care about wins over individual achievements is wonderful. Lucchesi just wants to win. He wants to be part of a winning environment and nothing else matters. I asked him how he felt on Tuesday and if he felt like he had his best stuff on the mound that night. “I felt really good. I felt like my pitches were moving well. I feel like I left two fastballs in bad locations over the plate.” It only takes a few mistakes to be victimized in this league. Lucchesi realizes that fact and is working hard to stay focused on each and every pitch. He has eclipsed 100 pitches only a few times this season. At Southeast Missouri State he threw 120 pitches per start pretty regularly. I wanted to get his opinion on his pitch count and whether or not he wanted to go deeper eventually. “In college, I did go 120 or so with my pitches. I was a big high pitch count guy then. This year it is all about getting a feel for pitching, I guess. I would love to throw more, but it is up to the coaches. I tell them I want to throw more.” He is a bulldog who wants the ball. 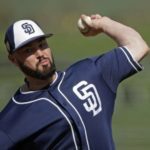 Taking it from him is tough during a start, but the Padres are being wise with this prized left-handed talent. I wondered if Joey was highly recruited in high school. “No. Nobody looked at me in high school. I was kind of small. I had a growth spurt and velocity picked up.” He was looked over like plenty of youthful pitchers each and every season. Sometimes it takes time for a player’s body to mature and grow. Lucchesi was a bit of a late bloomer when it came to his physical abilities on the mound. We next discussed the spring where Lucchesi was very impressive for the club. He pitched to a 1.54 ERA in 11 innings this spring but was still sent down on the last day of camp. 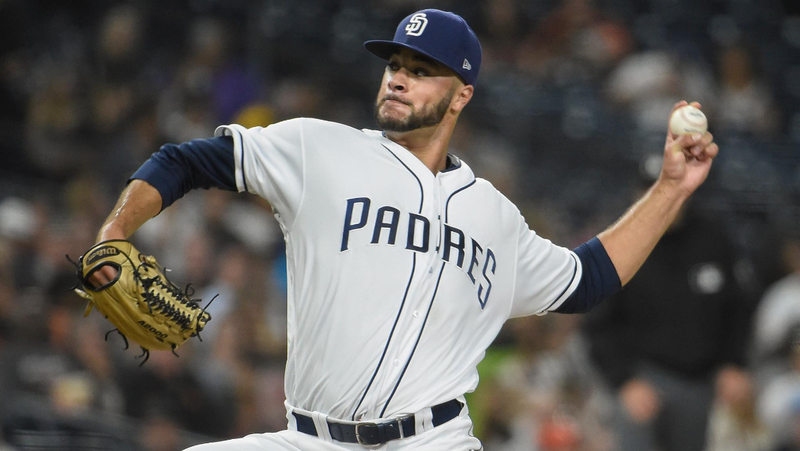 An injury to Dinelson Lamet gave Lucchesi the big league call he had been waiting for and he has not looked back since. We spoke about what a whirlwind those days were for him. “I made it to the last day of big league camp… They told me they were proud of how I did and told me that I was first in line for a promotion… I was getting set to go to Triple-A and the next day Lamet went down with an injury. The club called me in and told me and I was like- Oh crap.” A very honest response from this young man as he was stunned by the promotion. I asked how he was told of the callup and who was there. “I was brought into a room with all the pitching coaches and stuff. A.J. Preller was even there. I was sweating. It was crazy.” He was so excited and you could still see the energy in his eyes when we spoke about it. “I told my parents right after. 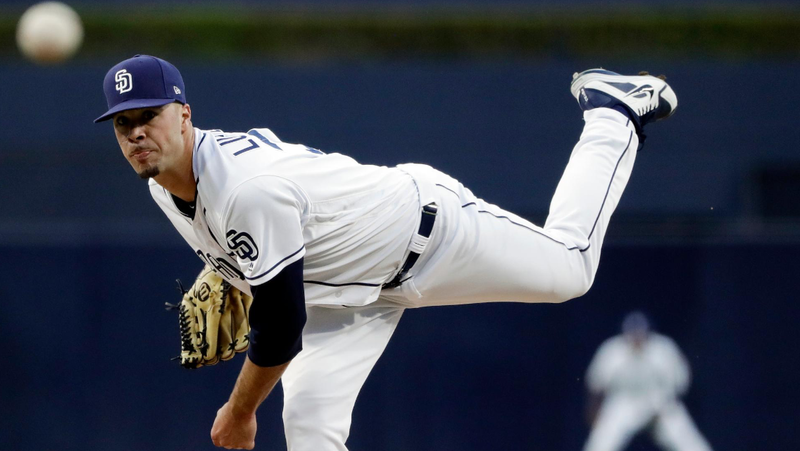 They (the Padres) told me not to tell anyone and that was hard.” The excitement was real for Joey Lucchesi as he had finally earned a trip to the major leagues. He did not need to wait long to inform every one of his promotion.